After another sleepless night (due to the intense heat!) I got up at 6am to do my final long run before my holiday! I couldn't believe it when I opened the door and already at 6 o Clock it was so hot and humid! I convinced myself to go by saying I wouldn't go for the full 15 mile run I planned if it was too hot and promised I could walk if neccessary! It was very, very hot and I did walk a couple of times! I managed 11.93 miles VERY slowly which can be viewed here. I'm feeling a bit of a failure at the moment! This time last year in my Marathon training journey I was doing much longer runs at a much faster pace! Anyway 3 weeks in America is really going help that ... NOT! NOT that I'm complaining - I'm just saying! We haven't had a run (pardon the pun!) of hot sunny weather for as long as this for a very long time! I set my alarm clock last night to get up at 6 this morning so I could run and beat the sun! However, my alarm wasn't required! It was so hot last night I don't think I slept for more than an hour! I was even threatening to get up at 5 to run but persuaded myself to stay in bed! However eventually at 5.30 I could bare it no longer and got up and got ready, leaving the house at 6 O Clock! Even running at 6 O' Clock it felt hot! My marathon training plan stipulated a 40 minutes run. I set off without a route in mind, but with the sole aim of running for 40 minutes. My legs felt heavy and tired, I felt like I was running on empty - not suprising really when it was less than 12 hours since my last run! No rest for the idiotic! I had taken a bottle of water with me not really expecting to need it on a morning run but finished it all before I got home! I'm thinking I was perhaps a little dehydrated after standing in the sun all morning waiting for HRH to arrive and then running in the heat last night! I managed a slow 4.88 miles in 46 minutes before school! You can view my run here. TODAY I finished for the Summer!!! Nearly 7 weeks off! YIPPEE!!!!! 3 weeks in America and then the rest of the time I will be running, cycling and swimming!!! 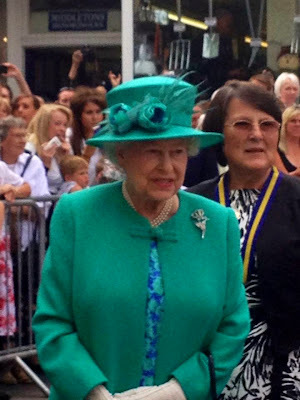 The day I saw the Queen! 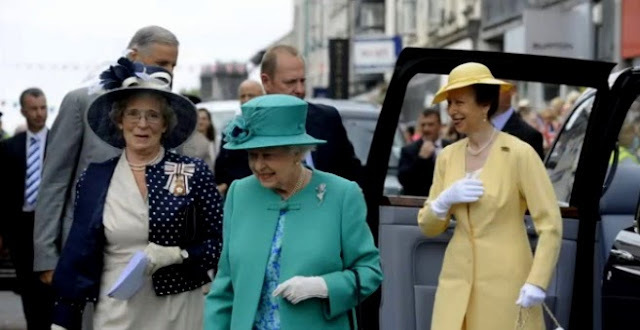 There was great excitement in Kendal today when the Queen and Princess Anne visited us! The entire school (where I work) walked down into town in a 200 child long "crocodile" and then had an hour and a half wait for them to turn up! Thankfully it was a lovely day so it was quite a pleasant experience. There was lots of flag waving and excitement when she eventually arrived and one of our 8 year old boys got to give her a flower posy! Certainly a day to remember! So after a very exciting day I still needed to fit a run in! I waited until I thought the intense heat had gone from the sun at around 6.30pm. Luckily I was only meant to do a 30 minutes easy run as the sun was still very hot! I found it exhausting and finished my entire bottle of water after 3 miles - it was that hot!! Anyhow, I managed 3.85 miles in 36 minutes! Not as slow as I had first thought considering the heat! You can view my route here. I am definitely going to get up early in the morning for tomorrows 40 minutes run! I already have my clothes ready in a neat little pile with my garmin, hat and sunglasses on top at the bottom of the stairs (so I don't wake everyone up! ), my water bottle is filled up and in the fridge! My alarm is set! Week 13 and the final week before USA! Week 13 of marathon training started yesterday with a 4 mile tempo run! As the weather is still incredibly hot I got up at 6am before going to work to get my run in before the sun! It was a much cooler morning and I actually shivered when I first stepped outside. This didn't last long and I was soon warm! It was another very quiet and uneventful run which consisted of a 1 mile warm up @ 9.18 minute mile pace, then the 4 mile tempo section at mile splits of 8.46, 8.54, 8.34, 8.37 and a cool down mile @ 9.39. I was pleased to have kept the tempo portion at a consistent pace. You can view this run here. My next goal is to get my tempo pace to 8 minute miles! Today I lost my senses completely and I finally bit the bullet and booked a Triathlon! I have committed (and probably need to be committed!) to the Kendal Sprint Triathlon on Sunday 29th September 2013 which isn't very far away, especially considering I am on holiday for 3 of these weeks turning fat and unfit! The sprint consists of a 500m (20 x 25m lengths) swim, 18km cycle and a 5km run. I only hope they don't expect me to SPRINT! After swimming and cycling I might be just about crawling! With this in mind I decided to go swimming tonight. I did a total of 2000 metres which consisted of 4 sets of 20 lengths. I managed set 1 in 12:54, set 2 in 12.45, set 3 in 13.04 and set 4 in 13.31. I will have to work out how to fit cycling and swimming into my marathon training plan! I have set myself goal times to aim for - I need the challenge to motivate myself! Total finish time goal: 1 hour 24 minutes which would put me as one of the slowest when looking at last years results! Death by Run - very nearly! On Friday I attempted to do a long run - which ended in disaster! Even though it had been extremely hot and humid all day I still thought I was invincible and attempted to do a 16 mile easy run at 4 O'clock, once I had finished work! This proved to be a very silly move! The first 7 miles went OK considering how hot it was, and then I took an energy gel and it all went downhill from there! I started to feel really breathless and my chest felt heavy! I started to slow down and eventually started to walk whilst I recovered. After glugging a large quantity of water I attempted to pick the pace up again and ended up feeling really dizzy and uncoordinated, I wasn't happy! If I suffered asthma I would have said I was suffering an attack, but I don't (or didn't!). I soon went back to walking and I think by this time panic had set in and my breathing became even more laboured! I was alone in the middle of the country and all I could think about was if I passed out I would be run over by the next car that came by! I decided to admit defeat and ring home for a lift! Unfortunately, no one was home so I left a message pleading to be rescued. I did consider getting a taxi (but had no money!) and very fleetingly considered ringing 999 but decided this was a little excessive! I continued on my weary way at a snails pace walk and nearly cried with relief when my phone rang! After an incredibly difficult and traumatic12 miles I was picked up and the song "What doesn't kill you makes you stronger" came to mind! You can view this disastrous run here. It took me the rest of the evening to recover and I still felt sick and dizzy a couple hours later! I had taken with me two bottles of water as well as energy gels so I shouldn't have been dehydrated or lacking in energy! I really don't know what was wrong - heat exhaustion? asthma? pollen affecting me? I don't suppose I will ever find out! Fingers crossed it doesn't happen again! Luckily Saturday was earmarked as a rest day and boy did I need it! Today was a 1 hour easy run! I decided to go as soon as I got up before the temperatures rose. Last night we had been out at a Summer Ball and had left the car in the hotel car park, so I ran my run and picked the car up! I was slightly apprehensive after Fridays disaster and was worried the same would happen again but although it was hot I had no ill effects!! This slow run can be seen here. I am going to continue with early morning runs this week to avoid possible heat exhaustion or general collapse! Running: 20.41 miles in 4 runs. 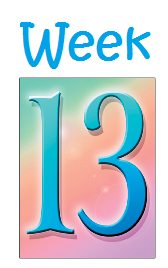 Here's to week 13 and the final one before my holiday! I'm so impressed with myself!!! Last night I was very brave and decided that I had faffed around quite long enough on the entering a "proper" Triathlon front and confidently logged on to the internet to book one! However I was foiled at the first hurdle! They asked me for my 500 metres swim time ... errrr I have no idea ... to just put SLOW was not an option! So tonight I went swimming armed with my pool mate watch to enlighten me on my current speed! It has been another hot day so I was pleased to be plunging into a refreshingly cool pool. Thankfully it was fairly quiet. I entered one of the lanes, started my pool mate off and swam! I struggled for the first couple of lengths to get my breathing under control. I think timing myself put pressure on me and I couldn't concentrate on my stroke initially. I eventually settled down into it and before I knew it I had completed my first set of 20 lengths. I had a minute or 2 rest and then set off to do another set of 20. By the time I had finished I had in fact swam 4 sets of 20 lengths totalling 2000 metres. Looking back to October 2012 when I first starting swimming in order to train for a triathlon my 500 metre (20 lengths) time was an incredibly slow 33 minutes and 35 seconds! I was so chuffed when I saw this huge improvement as I had it in my head that I wasn't improving when clearly I am! In 8 months I have knocked 21 minutes 27 seconds off my swimming time and that is with a 2 month break because of my ankle injury! So back to booking a Triathlon now that I have a time to insert! I was looking at last years results for the tri I am interested in and the swimming times varied from the fastest being 6 minutes 15 seconds and the slowest being 16 minutes 55 seconds. My 12:48 time would be quite respectable I feel! I also decided to look back in my blog to the end of last year to remind me what goals I had set myself. • Compete in a duathlon. • Experiment with off-road running. • Run another Marathon and improve my time: aim for a sub 4 hour time! • Run a sub 50 minute 10K road race. • Compete in a triathlon. • Run 12 races in 12 months. Under 8 minute miles over 10k (or shorter) distances. Retain resting heart rate at around 48 BPM, if goes above 58 REST. I am getting close to my 12 minute 500m swim goal, I have had a little bit of transition technique training from the Try-a-tri I completed, I regularly monitor my resting Heart Rate and I need to work on the rest! The Queen is coming to Kendal! This is very exciting for a sleepy little town like Kendal as no one important ever visits! Apparently her last visit to Kendal was 57 years ago - so I think we are long overdue a little bit of her Majesty's attention! Even more exciting is a child from our school has been selected to meet her and give her a posy AND the rest of the school are going into town to watch her go past!!! I must get a flag to wave!!! I set my alarm clock for 6am (and not 7.15 as in the picture!) yet again this morning for an early morning run - and actually did it for the second day in a row! The run on the plan was for a 1 hour easy run so I set off dead on 6am with a route in mind. It was a much cooler morning than yesterday and cloudy but lovely conditions to run in. I headed off out into the country and I was all alone! I felt a little vulnerable as it was so quiet - just cows and sheep mooing and bleating good morning to me on my way past! I only passed one man walking his dog the entire time - not a single car or cyclist! Very weird! Anyhow I managed 6.23 miles in just under an hour - 59 minutes and 44 seconds to be precise! The run can be viewed here! Tomorrow is a swimming night so I get to have a lie in to my normal 7 o clock get up time! This is rather fortuitous as I am off out tonight for a meal and a few drinks to celebrate my husbands birthday so the extra hour in bed will be much needed!